Little Curlew Satellite Transmitter Project: This is very exciting; watching science in the raw unfold before our very eyes. Fingers crossed for the Little Curlews - Ed. The Little Curlew which has been at its stopover site in the southern Philippines since April 24th is now on the move again. 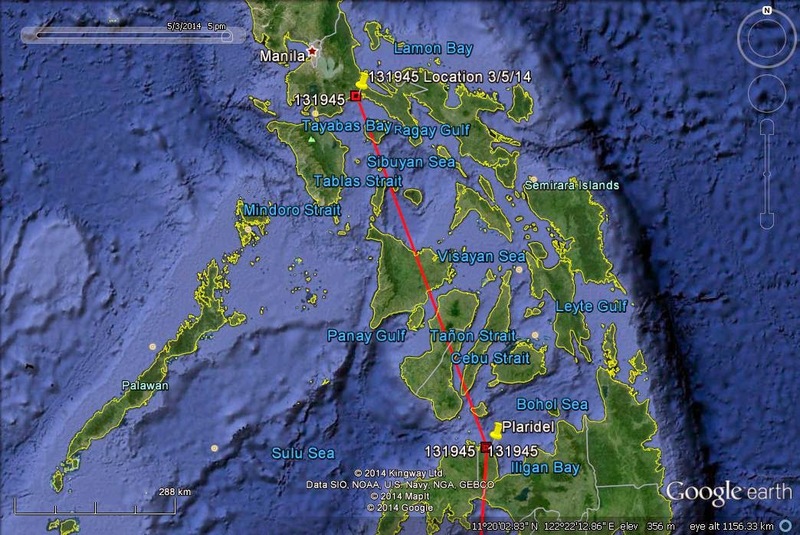 When the satellite transmission window closed on Saturday evening (May 3rd) the bird was flying northwards just to the east of Manila, having flown about 600 km since it set off on this leg of its journey earlier in the day (see attached map). We won’t receive another transmission on this bird for two and a half days by which time, hopefully, it will have landed at its next stopover site, probably in China. We have also had some exciting news from the Philippines about this bird when it was still at its stopover site near the little village of Plaridel. Ken Gosbell, who is chairman of the Flyway Partnership Shorebird Working Group, got in touch with his main Philippines contact, Carlo Custodio. 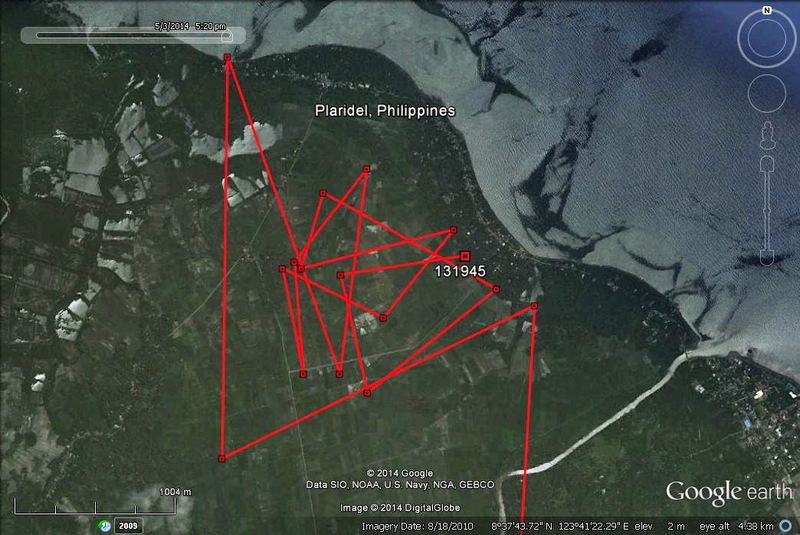 He in turn asked one of his ornithological colleagues, Roel Dahonog , to make a special journey to Plaridel to see if he could locate the bird. He was fortunate to be able to link up with a group of farmers when he got there and find that one of these had seen this bird several times on his land in recent days. The farmer had noticed that the bird was carrying something on its back and that it had a yellow plastic flag on its leg. Apparently the Little Curlew with the transmitter was with other similar birds, so it was presumably part of a small flock of Little Curlew which was making a stopover there. The habitat was quite wet farmland with rice fields and even mangroves nearby (see attached map for its movements there). The farmer had apparently alerted the Mayor of Plaridel who had assured him that the area was satisfactorily protected. The power of the international network of researchers and conservationists in the wader field in the East Asian – Australasian Flyway is amazing! Let us hope we can repeat this process at its next stopover. Incidentally this bird is the same Little Curlew (identified by engraved flag BD) which was also seen at Anna Plains and 80 Mile Beach in early March during its visit to that area. 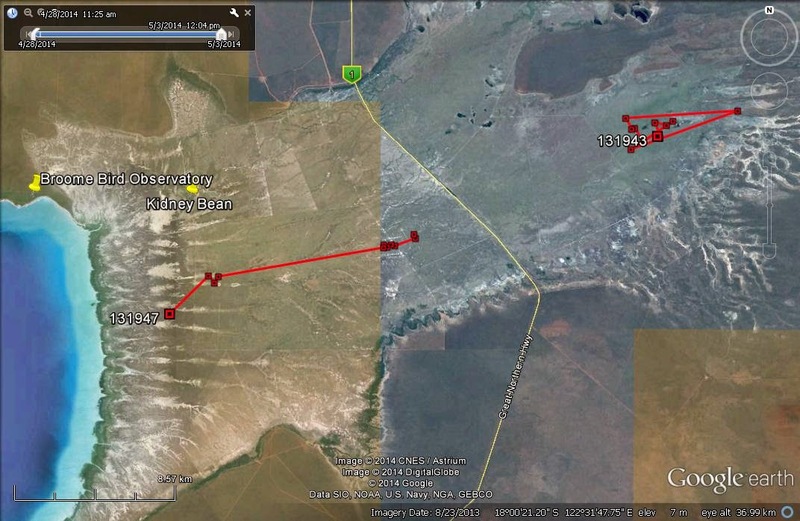 On the less positive side, the other two Little Curlew carrying satellite transmitters are still at Roebuck Plains. Most waders in northwest Australia depart before the end of April, apart from a few late Red-necked Stints and Sanderling which linger into early May and the piersmai subspecies of Red Knot some of which may not leave until mid-May. It does appear therefore that these two Little Curlew are now more than overdue to start their northward migration. Two core members of the wader team in Broome are going out to Roebuck Plains today to see if they can find these birds and to see whether any other Little Curlew are still present. They will be searching for the birds, and if they find them, checking the appearance of the birds and checking that the satellite transmitters are still correctly positioned. Both birds seem to be still roving around in the same way that they did when they were present there in November and December (see attached map).